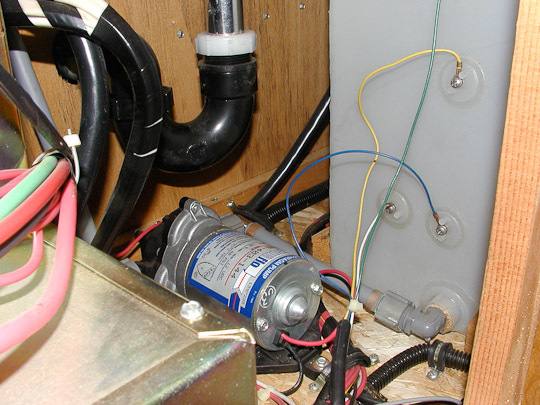 RVers Corner - Onan generator troubleshooting article describes setting the governor etc. GCWR = 18.500 lbs - I'm FAIRLY SURE! - but this needs to be researched and confirmed. During the pre-trip inspection, be sure to check the tires for signs of aging, weather checking, and/or ozone cracking — these show up as tiny cracks in the rubber surface on the sidewall of the tire. If the cracks are less than 1⁄32" deep, the tire is fine to run. Between 1⁄32" and 2⁄32", the tire is suspect and should be examined by the MICHELIN dealer. If the cracks are any deeper than 2⁄32", the tire should be replaced immediately. 1) Keep the tires properly inflated. 2) Keep the tires clean. 3) Avoid prolonged exposure to heat, cold, or moisture. 4) Avoid prolonged exposure to ultraviolet rays. 5) Cover the tires when the vehicle is not in use. 6) Do not park near electric generators or transformers. 7) Do not store vehicle in an area where welding is being done or in a garage that has mercury vapor lamps. STEP ON THE GAS, regain control, then slow down. Watch Michelin's video on YouTube How to Handle a Tire Blowout in Your RV. "Have you ever wished for a mini tire repair kit that you could carry with you while out on your quad, motorcycle, or your street rod in case you got a flat. With the parts in this little kit you can repair almost any flat in any tubeless tire and air it up within seconds. If you're low profile tire is low on that Porsche, BMW or Escalade this product can air them back up on the spot...."
See a review in the Fall 2009 Airstream Life Online Edition. That's the fresh water tank showing on the right with its monitor sensor wires attached. Replacing RV battery cables - a good article. This boondocker also has some articles on installing Solar. Captain Tolley's Creeping Crack Cure - I haven't tried it but this stuff is supposed to be the cat's meow for those smaller difficult to find and seal leaks. Interested in designing your own rig? Andy Baird's Lazy Daze Pocket Guide to models and floor plans, specs, changes over the years, etc.